EMBARQ India is releasing Bus Karo 2.0, which analyzes bus services in cities across India and will inform urban planners, designers, and bus operators in order to help increase bus mode share. Photo by Benoit Colin/EMBARQ. Like many cities around the world, Indian cities are experiencing urbanization, motorization, and increasing congestion. Coupled with declining public transport use and infrastructure expenditures that promote a car culture by building roads and flyovers (overpasses), Indian cities are losing out on the standard of living that residents deserve. The next decade requires focus on precise and system-wide improvements. The call of the hour is to introduce operational, infrastructural, technological, marketing, and financing innovations to double the mode share of public buses in the next decade. For Indian cities to be livable, city bus and bus rapid transit (BRT) systems must become an integral part of urban development. As of 2005, buses made up over 90% of public transport in Indian cities, and serve as a cheap and convenient mode of transport. There are approximately 35,000 buses operational in Indian cities. Of these, eight of the biggest cities – Delhi, Kolkata, Mumbai, Chennai, Bangalore, Hyderabad, Ahmedabad, and Pune – account for 80% of all buses. Pilot initiatives and bus reforms in recent years have reinforced that city bus systems will continue to be the backbone of urban mobility in India because they are cost effective, more sustainable, and easier to implement than other infrastructure-heavy mass transit systems like metros. The graph below shows the current mode share of bus transport in ten major Indian cities. Bus mode share varies significantly from city to city in India. Graphic by EMBARQ India. Data from 2007-2011 (excludes non-motorized trips). How can Indian cities improve bus services? Recognizing the need for improved bus services, many Indian cities have transformed mobility through the implementation of innovative bus transit solutions in recent years. For example, the BIG Bus Network in Bangalore provides high-frequency bus services along major arterials in the city, a driver training fuel efficiency program – initiated by the Andhra Pradesh State Road Transport Corporation (APSRTC) – has now been implemented by bus operators in cities across the country, and BRT systems have been introduced in cities like Indore and Bhopal, to name a few. To ensure that city bus services continue to be major transport modes, promoting innovation among bus operators is imperative. While these advancements have begun to establish best practices for Indian cities, there is still need to examine the challenges faced and the lessons learned during implementation and continued operations. In addition, greater effort is required for these innovations to succeed in the long term. The industry is comprised of several authorities and players, facing various difficulties. Bus manufacturers, for example, continue to use truck chassis to build buses, compromising their safety, comfort, and convenience. There is also a shortage of skilled workers to manage adequate maintenance and operations standards, which is a significant problem for operating agencies. Furthermore, there is a lack of coordination among multiple players to allocate land for transit infrastructure needs, resulting in the industry falling short of its potential. Today, EMBARQ India is releasing Bus Karo 2.0 – Case Studies from India, which provides an overview of the current state of urban public transport systems in India. Findings in the report highlight the phenomenal growth of bus transport and the implementation of new technologies, service financing methods, and management techniques. The report takes a close look at key areas like planning and operations, support infrastructure, fuel efficiency training and management, technology applications, branding and marketing, and financing models. 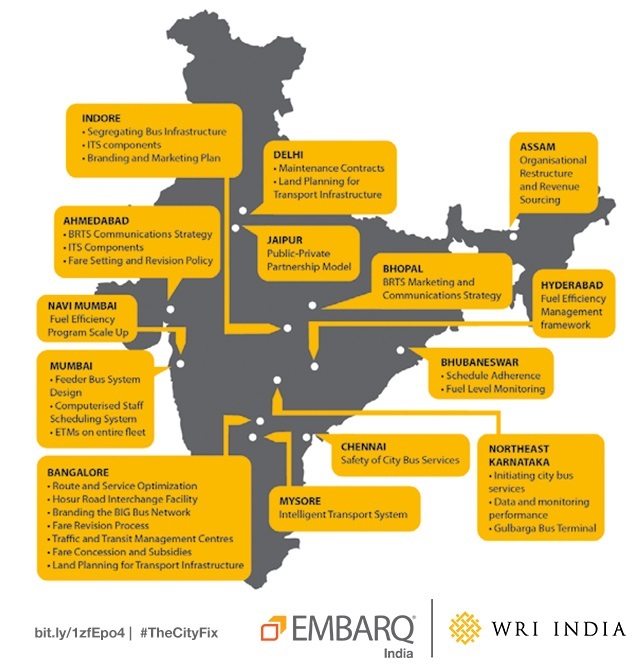 The map below shows the extensive work by EMBARQ India analyzed in the publication. 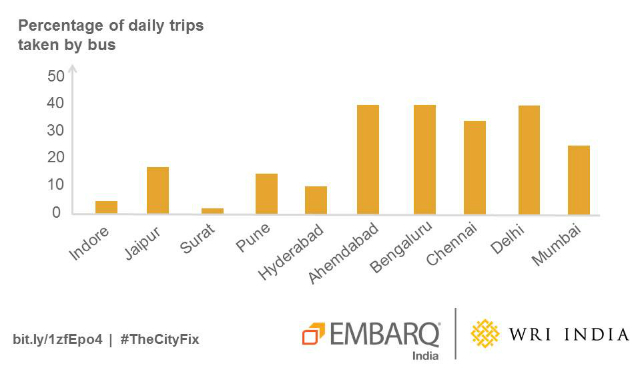 EMBARQ India is improving bus systems in cities across the country. Graphic by EMBARQ India. The way forward is to maintain this momentum and gradually work towards increasing public transport’s mode share in Indian cities. Specifically, EMBARQ India transport experts strongly recommend that by 2020, bus transport in Indian cities should comprise at least half of the modal share of all motorized trips in cities with at least 10 million people and at least one-third of the modal share in small and medium-sized cities. As mobility needs change, it is important that a city’s transit system responds effectively and swiftly. Bus transport has proven to be flexible to such changes with minimal investment and greater efficiency. To learn more about bus transport in Indian cities, read the full Bus Karo 2.0 report here.